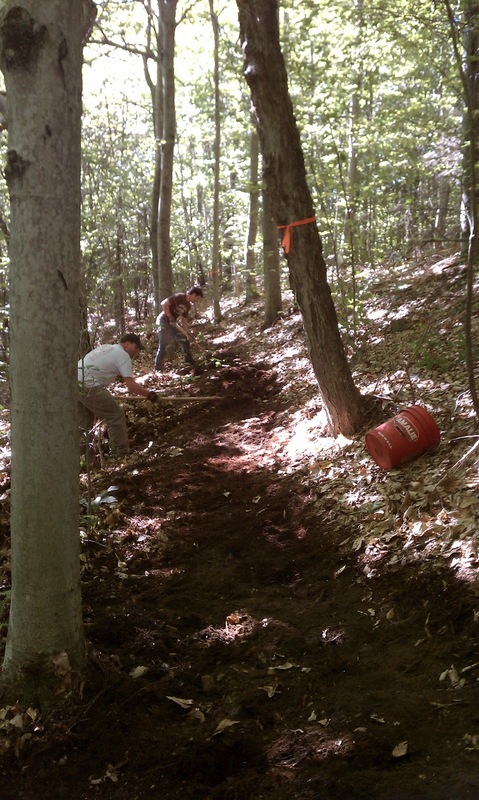 Big weekend of trail work scheduled at Bear Brook the weekend of Oct 6-7th. 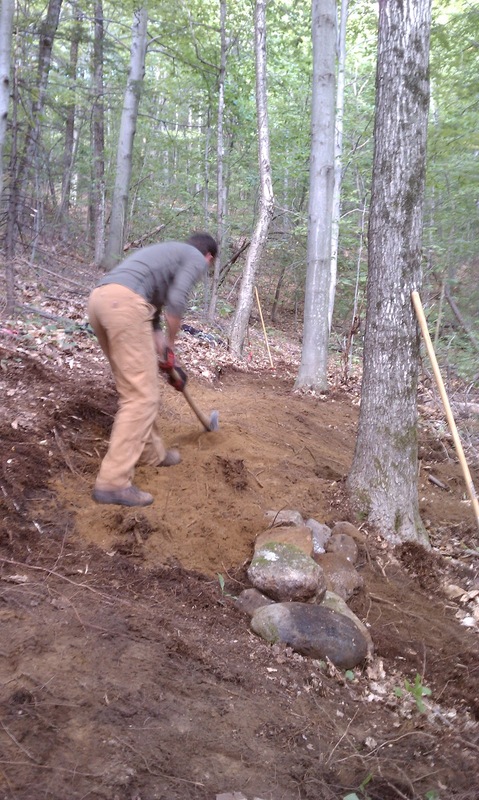 The Southern NH Chapter has some new singletrack planned as well as some cleanup. If you ride Bear Brook often head down and lend a hand! 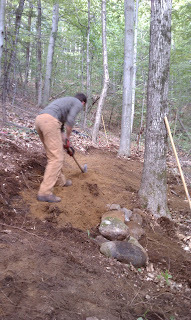 A smaller but efficient crew of 7 got to work today on Trail #9 (AKA Hydra) that will connect Bear Claw down to the Access Rd. 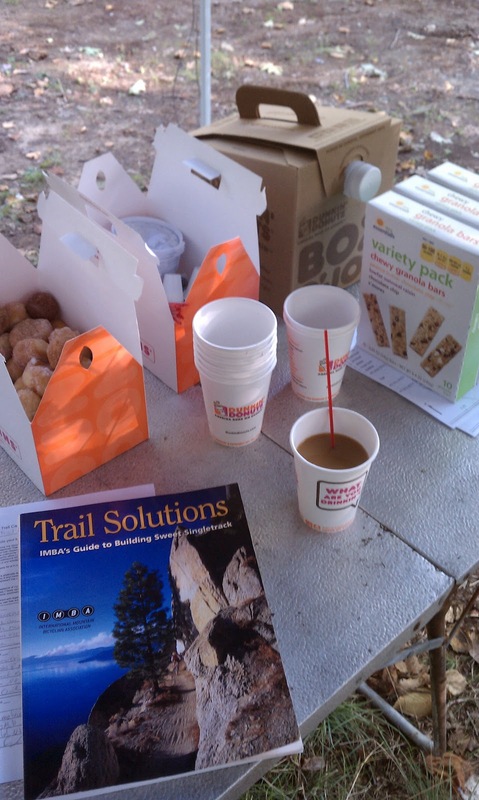 and offer a nicer way to work your way back to the parking lot after having completed Spring Trail. 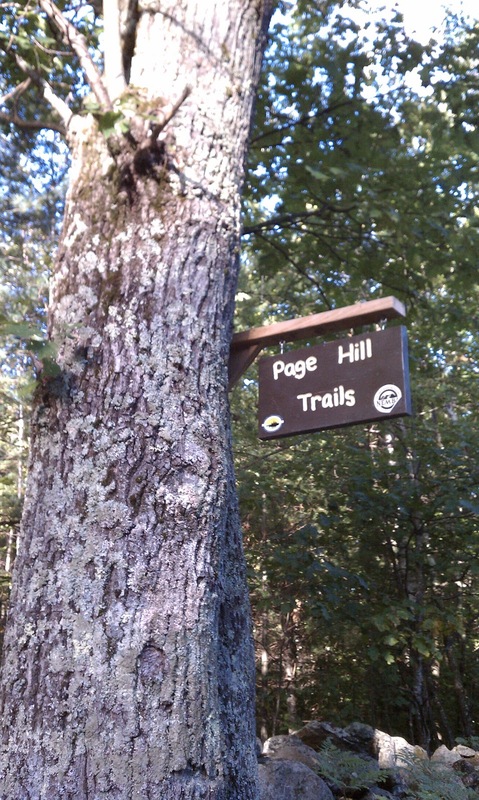 Once its done Page Hill will have a complete perimeter(ish) loop of around 7-8mi. We didn't quite complete the trail today but we did get the brunt of the heavy lifting done. A fewer longer sections of bench cutting and a stream crossing or two got roughed in. Much of the rest of the trail will be rake and ride. 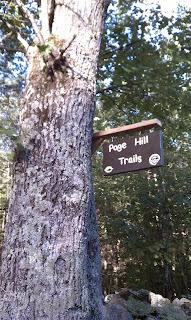 One more trail day for Page Hill is planned for this year. We are hoping to be able to finish Hydra off and complete our loop as well as begin looking into work on Trail #12 (AKA Magikal Mystery Tour). Always work to be done! We got a great tour of some of the new stuff going in at Ramblin Vewe Farm in Gilford last night. Great terrain, lots of potential and already riding in nicely. We were able to get all of it in without needing lights (barely) but our Thurs rides will probably be transitioning into 'lights required' in the very near future. I believe a new Trail Map for the Farm is in the works once everything gets squared away. As soon as all of that gets figured out we'll get the map up here. Also of special note, I cleaned the Hill of Doom on my SS. It hurt terribly and I saw stars at the top but it is possible. Don't forget we've got our Trail Day at Page Hill this Sunday. We're so close to having a nice big, awesome loop to ride there. Come help us finish it off! Help build a NEW trail! 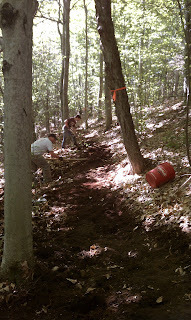 This new trail will start at the lowest switchback on Bear Claw and take a gentle route to the bottom of the Access Rd. It will be a nice addition that isn't a gut-busting climb. Tools and water will be supplied. Bring snacks, work gloves and insect repellent. You might also want to bring your bike to ride after. We hope to see you there!